South American-based online slot developer Leander Games has gotten into a fine habit of releasing slot titles that poke a light-hearted finger at some rather sinister topics. Previously we’ve seen their slot release of Castaway take a comical look at a man who is stranded on an island by himself and their release of Snake Slot made snakes look like your best mate and not vicious little shits that can bite you and kill you. 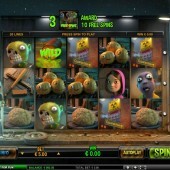 Now it is the turn of a zombie apocalypse that is given the Leander Games hilarity treatment in this Zombie Rush slot. Zombie Rush is a 5 reel, 20 pay-line slot title and from the very first play you can see that it not only has the patented Leander Games vibe but also the smooth graphics that the developer is becoming renowned for. Symbols on the reels consist of the hero and the heroine of the hour, weapons, various zombie creatures, a brain and a quarantine warning sign. The toxic waste spill acts as the Wild and if you hit one of these symbols over a zombie creature symbol then you will trigger the Nuclear Zombie Bonus where you can win re-spins as the Wild symbols infect those around them in what is essentially a Duplicate Wild feature. Find Claire and Win Big! This slot also has a Pick ‘em Bonus-style feature called the Finding Claire Bonus. Claire is the heroin of the slot and if you hit three or more Bonus symbols across the reels then you will be taken to a second screen where you must search a house to find Claire before the zombies get her to win prizes. There is also a free spins bonus round which adds a little spice to proceedings. You must hit three or more Free Spinz symbols across the reels to trigger the free spins bonus round where you can win 10 free spins. 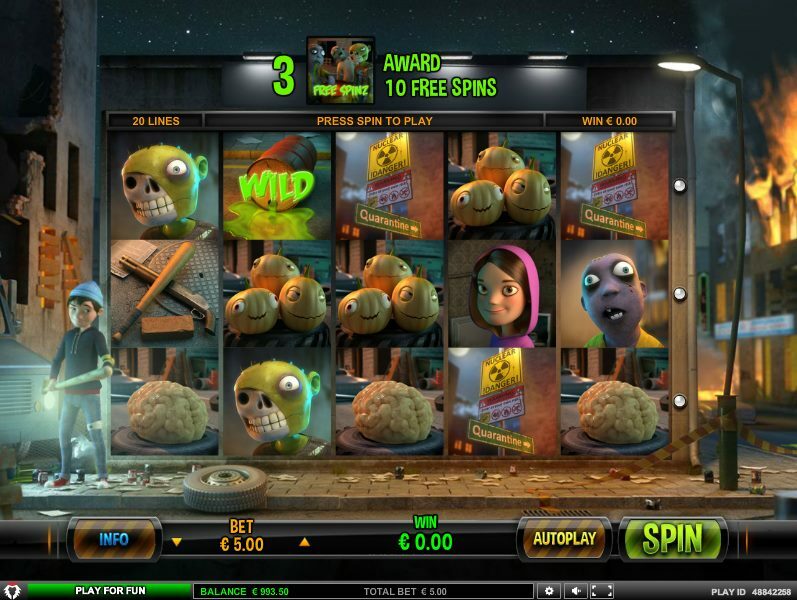 During the free spins, the zombie symbols will appear stacked so you stand more chance of hitting some winning combinations. Zombie Rush might not have been as highly anticipated as The Walking Dead slot will be when it is released online but this is a tidy little slot that Leander Games have got on their hands. I would say it is at least on a par, albeit not as gory or dark, with NetEnt’s own zombie-fest slot Zombies and that is not a bad conclusion to reach.